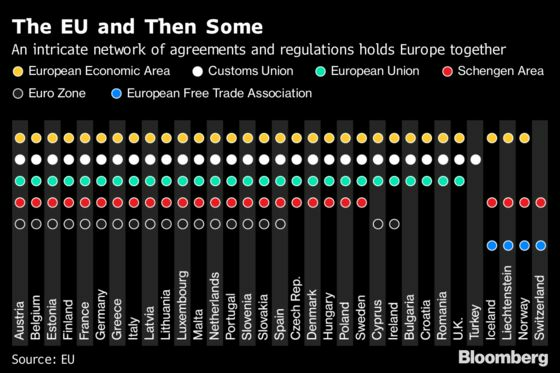 (Bloomberg) -- Momentum is building in Britain’s Parliament for the softest of Brexit models, as opposition politicians group together to support a plan to keep the U.K. inside the European Union’s single market. The proposal, which includes a bolted-on customs union arrangement, is building up steam after the main opposition Labour Party and the Scottish National Party backed it. Prime Minister Theresa May has set herself against staying in the EU’s single market and a customs union, because to do so would wreck two key aims of the pro-Brexit campaign: to end unlimited immigration from the EU and to set the U.K. free of EU tariffs to strike trade deals around the world. But it is a sign of the prime minister’s weak position -- and of Britain’s chaotic politics -- that she has lost control over the direction of her most important priority, delivering Brexit. While companies and investors have long favored the option of staying within Europe’s borderless market for goods and services, a vote for the proposal would prolong the uncertainty that’s frustrating business. The pound rose before the vote. The House of Commons is debating four rival options to May’s three-times rejected Brexit deal and politicians will vote on them on Monday evening. If she loses the votes on Monday night, and the Commons backs single market or customs union membership, May will face a painful set of choices. She could abandon her red lines and embrace a soft Brexit, which would split her ruling Conservative Party and could bring down the government. Or she could try to use the prospect of a soft Brexit as a way to persuade euro-skeptic doubters in her party to back her own deal, putting it to another vote potentially on Wednesday. May could decide to call a general election or even another referendum and ask the public to settle the issue. The premier will lead what is expected to be five hours of meetings with her Cabinet on Tuesday to decide on the way forward. Britain is due to exit the EU in just 11 days. Before April 12, Parliament must pass May’s deal, agree to a different plan, or face the threat of leaving the EU without one. The so-called Common Market 2.0 proposal by Conservative former minister Nick Boles, was defeated by 283 votes to 189 in the first round of voting last week. But SNP and Labour support change the math dramatically and could see the proposal achieve a majority. Last week, 225 of the Tory party’s 314 members of Parliament opposed the measure. The other options for debate on Monday include staying in a customs union with the EU, holding a referendum to endorse whatever Brexit deal Parliament comes up with, and a process to rule out a no-deal departure. Members of Parliament will vote on them at 8 p.m., with the results expected a couple of hours later. Last Wednesday, when MPs usurped control of proceedings from the government for the first time, they voted on -- and rejected -- eight options. The customs plan came closest to a majority, losing by 6 votes. The Common Market 2.0, or Norway Plus, plan was only the fifth most popular, though neither Labour nor the SNP ordered their members to back it. Adding the SNP’s 35 members of Parliament, who abstained last week, to the support column would reduce the deficit to 59 from 94. And Labour politicians could then swing it. A total of 60 of them abstained the first time around, while 42 opposed the plan, meaning the result could be reversed if enough of them vote for it. In a strange twist, though, at least one SNP MP won’t be able to back the plan on Monday, despite his party’s instructions. Angus MacNeil is stuck on the island of Barra, northwest Scotland, because a military no-fly zone prevented his civilian plane from taking off.